China and Its New Year! Happy New Year Dear Neighbor!!! The new moon that rises brings the Chinese people their new year! 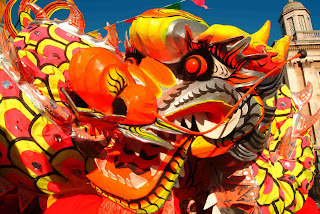 (2007 is the year of the pig for the Chinese) A new year for the Chinese is much more than just that. From time immemorial, people of China all around the glob celebrate it with the gaiety that is unheard of in any part of the world. This period witness the biggest human influx of the Chinese all over the world towards their native place, because taking part in the new- year feast with relatives and observing the innumerable rituals associated with it are for them more precious than all the savings they would have made throughout the rest of the year. 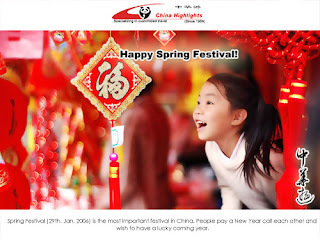 As their new year starts with the appearance of the new moon it is also called the lunar new- year, spring festival is another pet-name they have attributed to this period which is for them the mother of all celebrations. It all begins from Chu-xu the new- year eve (chu = change and xi = eve) a new moon and ends on the 15th day with the “lantern festival” (on a full-moon). 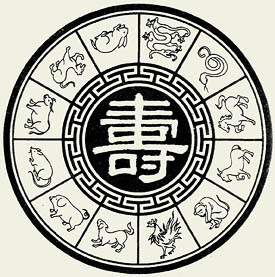 Between January 21 and February 20 as per the Gregorian calendar, these are all calculated by the “luni-solar” calendar of the Chinese order which is also followed by the surrounding countries with “Han culture” like Vietnam, Mongolia, Korea etc. Red color is the associated with these festivals (the myth behind is that once there was a monster by name “Nian” which lived on the mountains and ate human beings for a living! The use of red color and cracking of crackers all associated with the festivals are supposed to scare away the Nian the villain). The festivals last for about 15 days. Houses are thoroughly cleaned (this is supposed for the removal of bad-luck from the home) and all the materials used for cleaning –like brooms, brushes etc are discarded along with the trash that is left away. There after the houses are not cleaned even if it is cleaned the trash is not thrown away but kept in a corner of the house, this heap not trampled upon by any means. All the relatives assemble for the dinner and lavish servings of chicken and fish is the specialty of the “chu-xi”. It is the main event of the whole celebrations that pulls the Chinese from all around the globe to their native places because a collective feast with all kiths and kins is something which arouses a peculiar nostalgia and a pleasure that cannot be counted in terms of cash. First day is intended to welcome the deities from heaven to earth. (These rituals have striking similarities with those in India). This day eating of meat is generally avoided as it is believed that it may affect longevity. Second day is dedicated to the daughters they are free to visit their parents and stay with them – a rare opportunity for them to enjoy the affection of their parents. How a Chinese daughter worth her salt can ignore such a golden opportunity. The third and fourth days are considered inauspicious for home visits and it is left for family members to stay at home and enjoy. Fifth day is dedicated for eating fish and puddings of various hues known by name “jiaozi” (puddings with fruits)! Sixth day is vacant (programs decided by the joint action committee of the home! Eighth vacant and free for all! Ninth day is for prayers to Jade the emperor of heaven and offering him sugarcane and burning of incense sticks as a mark of love. 10th to 14th days are for mere celebrations, visiting relatives exchanging gifts and pleasantries etc. The last (15th) Lantern festival-day is the end of celebrations exchanging of red packets to younger ones is a custom there may be some money in these packets the amount not specified and depends upon the fancy of the senior. During these festival seasons wishing happy new- year (Jixianghua = wishing, Pinyin = happy new-year) loudly is a Chinese custom. China has its own version of Valentine (Chap Goh Mei) The end of the festivals (the lantern festival) is celebrated for him. We on behalf of the blogging community wish the Chinese a very happy and prosperous New-Year. 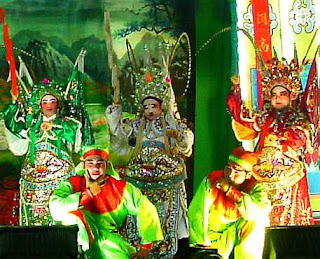 Chinese celebrations as well as chinese daily affairs, are absolutely unknown for most of westeners and latin americans. So I am glad for finding your blog. Anyway I saw a few very good chinese movies, and I like your cinema. It's different and more realistic than most of the average movies. Give a look to my blog. This is not a good marketing. Any blogger writing to your blog will understand your desire to promote Kerala and the places where you live, but... people like to talk with people. Generalizations and numbers will not work in the west.